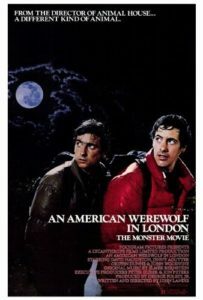 013 – An American Werewolf In London | All Eighties Movies. All The Time! This entry was posted in Podcasts and tagged american werewolf, comedy, horror. Bookmark the permalink. Well done guys- very enjoyable #AAWWIL PC & I laughed a lot! Interesting plot observation-the people in pub know the secret but they leave the guys to their own devices! Loved Gidgit’s attitude towards the annoying kid in hospital-deny the brat medicine & let him die! Ha, ha! Yes the film did end ubruptly. Great to learn this movie led to best makeup effects in film category-well deserved. Made 30 + mil at box office & is a cult classic too. I LIVE in ‘puffy coats’ as I live in Alaska. Fun pod cast. Listened to it as I was cutting down trees. Laughed a lot. You two are funny. Will check out your other pod casts. It’s WETA not Wepa! Aside from that good podcast. But it really pisses me off when podcasts get their information wrong. Sorry it just does. This is my all time favourite move from the 80’s so I’ll give you that you gave it credit and respected it. Just do more information please!! ***Applauds***…ANOTHER great entertaining podcast that took me ‘way back’ – only one question , ’81 – how did that happen? I remember this coming out in England , I would have been 9, and the fanfare for the special effects, people (adults) talking about it. 1st as said the effects ‘apprentice’ went on to make The Thing. 2nd it made the Special effects art a recongnised award. 3rdly this led to Michael Jackson’s Thriller – as Jackson loved it and employed Landis based on the results. These 2 have great references and knowledge to English culture in the day with well appreciated shouts to Kenny Everett, Tom Baker as Dr Who AND The Goodies (then slagged off British TV later, but we wont mention that) my wife is Irish and wouldn’t know of Everett and The Goodies ! On the TV references the amazingly great but heartbreaking late Rik Mayall (playing chess in Slaughtered Lamb) went on to be in one of England’s most loved comedians, and started into the equally 80s Retro The Young Ones ! Slightly worried to hear of the remake – hope it doesn’t to trend and go on to be CGI’tastic’ .. i hope he doesn’t ruin Daddy’s gift. ..on the seat belt reference, yes I remember family holidays in the back of Dad’s Vauxhall Viva estate – in the boot with the luggage for 40 miles 1-2 hrs ! waving at/annoying the cars behind … Health n safety ? pah !! The first time I saw the movie… Or didn’t… Was during science class in the 80s. The teacher wheeled in the TV and VCR and put a tape in. He put his fingers to his lips and left us be, how strange. I wonder if he was having a sly pash with someone? Anyway, I was at the back of the room, there was glare on the screen so I saw nothing. My new podcast on the way to work. I need to catch up which I will do. welcome quentin, and thanks for listening!